2. Chop off the top of the head of the garlic, add a touch of coconut oil, season with salt and pepper and wrap tightly in aluminum foil. In a large silpat-lined baking pan (I used a 9×13 glass baking dish), combine red pepper, fennel, zucchini, carrot, onion, and mushrooms. Dab coconut oil overtop veggies, place in oven to allow it to melt, then stir into the veggies. Season with salt and pepper, cover with foil and roast for 40 minutes, stirring half-way through. Remove foil and continue to roast another 10 minutes, to allow the vegetables to brown. 3. Meanwhile, reserve half of the white beans and set aside. Add the other half of the beans to a food processor and puree until smooth. 4. In a large pot, add pureed beans, vegetable broth, tomato paste, red pepper paste and beans. Bring to a boil, reduce heat and allow to simmer. Once your roasted vegetables are ready add them to the pot. Remove cloves of roasted garlic and smush to make a puree. Add this to the soup as well. Add the cabbage and cook for an additional 10 minutes. 5. Season with salt and pepper and serve warm. Want a real ribolitta? Serve with a slice of toasted bread. I wish I had this in my fridge- so cold out!!! 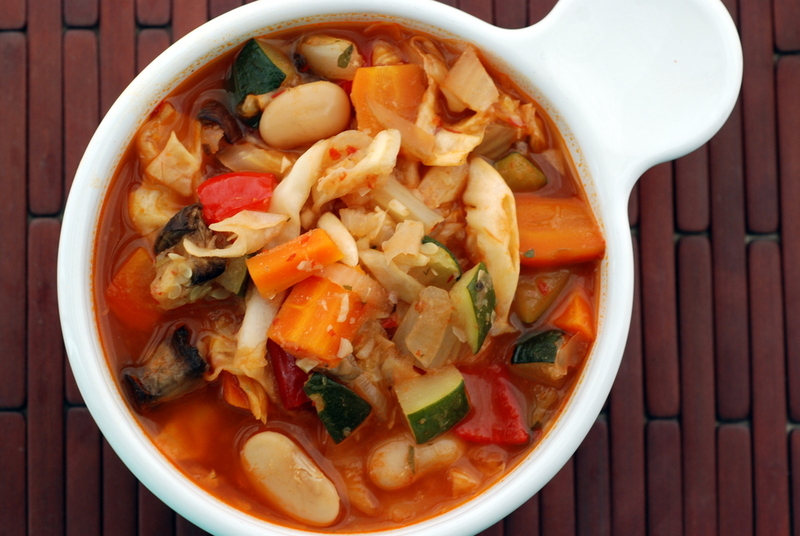 I love soups with beans and cabbage, so much fiber and staying power. This is one of my favorite stres. I love all things Italian. This week I healthified a spaghetti pie recipe my mom used to make.editedreanean food can so easily be made into a healthy meal option! I thought it was funny that the article suggested that it was just unreasonable to expect that people would be able to follow a vegan diet. I think a few good studies examining its benefits could change some minds about that! I’m glad I’m not the only one who judges my weeks based on the food that I’ve made. Good eats = a good week! This soup would definitely get me excited to wake up and go to work every day, knowing I could have it for lunch or dinner or both! i can’t seem ot get enough of hearty tomato-based soups this winter. i have a russian pepper paste called ajvar — i wonder if it’s similar– in any case, i bet it would go great in this soup! oops – i meant ajika! we have ajvar here, too, but it’s more eggplanty! I’ve heard of ajvar but not ajika. Is it spicy? Wikipedia likens it to vindaloo strenth – oh my! I have only used the mild Turkish red pepper paste which is sweet. There is a hot version but I have yet to try it. It does look great. I had a craving for soup this morning, but I will have to save this one for another day and do a bit of a shop first. Think it will be a simple carrot and lentil soup for me today. Try putting turnip, diced, in your lentil dishes. The flavor blend is really wonderful, I don’t want to keep it a secret. Ribollita is such great comfort soup. I love how colorful this one is, all the roasted veggies and those big white beans. 😉 Thanks for sharing with Souper Sundays. We’re heading into autumn and winter here in NZ, so I’ll be giving this a go to keep us warm – looks like a winner.